I thoroughly enjoyed reading each and every comment you all left on the Final Countdown posts. From hearing your methods for organizing, to seeing what you have planned for the coming year, it’s all interesting and inspiring to me, and hopefully to everyone else reading, too. I just love a fresh start, and I’m all motivated for a while — I hope that feeling sticks around! How about you? Do you feel like you’re off to a good start? I managed to get my cutting table cleared off, just in the nick of time! And no, I didn’t just chuck the rest of the stuff from yesterday into a box and hide it (altho that was a very tempting thought). I took the time to put it away where it belongs. The only things left out are my tool caddies, which are always there, and two current projects, which is all I’m allowing on the table at once from here on (hopefully). You might check in with me periodically on that one, OK? It was a shock to walk in this morning, and it was all clear. It felt very, very strange, but I sure wanna get used to that feeling! I’m gonna try my friend, Barb’s, suggestion to clear it off every night before I quit for the day. There’s a lot of white (and glare) in that photo, since I moved my red polka dot curtains into the longarm room. I need to make the new curtains and get them hung up! I’ve been asked many times about whether I’m continuing the Studio Organizing Challenge this year. The answer is: Sorta. I’m going to still be doing organizing tasks around here, and I’ll be showing you what I’m up to, but simply repeating the tasks we’ve done for the last two years seems a bit stale. What I plan to offer up this year is a little more in-depth information on how I’m doing some of the organizing tasks, and show you the things I’ve managed to get organized, and the things I’m still working on. And I might throw in a challenge now and then. I’m hoping for a bit more of a give-and-take style to the organizing posts this year — I’ll show you what I’m doing, but I’d love to hear your ideas and suggestions on how you’re doing the same thing. My Grandma always said, “There’s more than one way to skin a cat.” I know that my way of doing something is not necessarily the best way, and for sure not the only way, and I’m hoping to foster discussions on the many different ways that we all do something like, say, for instance, organize our thread. So stay tuned for those posts, and be sure to join our discussions as we delve a little deeper into getting more organized as the year goes on. And if you want to work your way back through the past Studio Organizing Challenges, they’re all listed on THIS page, so you can scroll through and choose the ones you’d like to work on. I’ll be doing some of them myself quite regularly. Meanwhile, it’s time to draw for the winners of The Final Countdown prizes! I’m so happy that so many of you joined in yet again. I’m drawing one winner from the commenters from each task, so here we go . . .
Congratulations! And thanks so much to everyone who played along! We’ll do it again at the end of this year! I loved seeing your clear space for working on current projects. I have downsized so went one step further, allowing only one project at a time out unless I have a simple leader and ender that will fit easily on a tv tray next to the sewing machine. My space is small so keeping things orderly is crucial to my stress level. Shelly, I am SO proud of YOU!! You did it! Now, do your best to keep it that way. Just take 5 minutes to put it away at the end of the day and you are set! You will love walking in to a clean room. The ideas will start to flow the moment you walk into the room and you will be so much more productive! What are you looking for in curtains? How about lace ones that go up about 3/4 of the way? (Hang it with a tension rod so you can easily change it out if you want something else or want to change the height.) It will give you some privacy, but will let in a lot of light. And, you’ll be able to see out OVER the curtain. I’m excited for your new space. Great job!! You are such an encouragement to me. It’s good to know that others struggle with the same things. It makes doing the task a bit easier knowing I’m not alone while I’m tackling the task. Thanks, Shelly! Your room looks great! I am open to anything that helps me stay organized and get a bit more organized. On another group, they are doing WITB – What’s in the box Challenge. Daily you are supposed to take a box (bags for me too) and go through it to see what is in it. You are to take the things and make sure they have a home and are in that home. 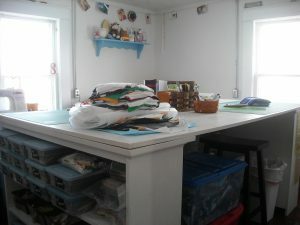 So far, I’ve had very little quilty things in my boxes, but I am making progress on having boxes and bags hanging around the studio. Shelly, your cutting table is amazing! Congratulations to all the winners. Looking forward to another year of blocks & organizing…..my cutting table is trashed right now trying to sort through & that seems like the only flat surface that wasn’t already covered. I hope next year at this time it will look like Shelly’s.